U.S. mayors have passed a resolution urging cities to forbid the use of gasoline produced from Alberta’s oilsands. (CBC)U.S. mayors are adding their voices to those raising concerns about energy produced from Alberta’s vast oilsands. The U.S. Conference of Mayors, meeting in Miami this week, has approved a resolution calling on its members to ban the use of energy from unconventional sources because of its impact on the environment. “We don’t want to spend taxpayer dollars on fuels that make global warming worse,” said Eugene, Ore., Mayor Kitty Piercy, who submitted the resolution. The mayors said importing oilsands fuel slows the transition in the United States to cleaner energy sources. “Global warming is one of the most critical issues facing our cities,” said Mayor Frank Cownie of Des Moines, Iowa. The province has strong environmental standards in place, Knight said, along with its own climate-change program. 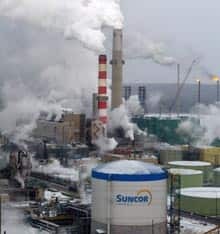 The provincial government’s plan to limit greenhouse gas emissions focuses on the development of carbon capture technology to store carbon dioxide underground so it will not escape into the atmosphere. But the plan, announced earlier this year, does not require industries to reduce their emissions until 2020. Alberta Liberal Leader Kevin Taft also waded into the debate Monday, saying the province can’t afford to ignore the warning from its southern neighbours. Alberta has seen growing protests over its oilsands development. During a visit to Washington earlier this year, Alberta Premier Ed Stelmach faced protesters demanding a ban on what they called “dirty oil” from the province’s oilsands. U.S. legislators have already adopted laws that limit the use of fuel made from unconventional sources because of its high greenhouse gas emissions. But U.S. officials say the regulation will not apply to oilsands production. This entry was posted on June 23, 2008 at 11:49 pm	and is filed under Uncategorized. Tagged: alberta government, boreal forest. global warming, climate change, dirty oil, ed stelmach, emissions, high-carbon fuels, oil sands, resolution, tar sands, US Mayors. You can follow any responses to this entry through the RSS 2.0 feed. You can leave a response, or trackback from your own site.